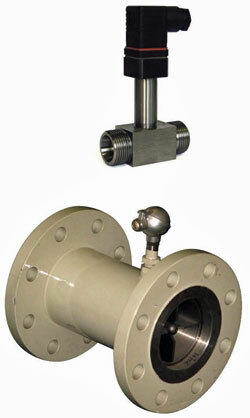 Model DR12 Turbine Flow Meters are sturdy turbine-type flow sensors suitable for mobile or permanent installation. A turbine wheel set in motion by a flow parallel to its axis rotates at a speed proportional to the average speed of flow in the piping system. The movement of the turbine wheel is detected by a contactless pickup (coil). The resulting output frequency is a reliable indicator of the flow volume. The turbine body and the measuring unit are made of stainless steel: The bearing is made either of tungsten carbide or Teflon. These flow sensors are available with male threaded (max. 2″) or flanged connections (max. 16″ / DN400).